Digital Earth Contest will be released soon! 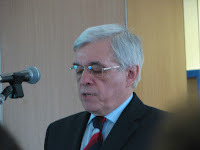 The Conference held at the HUNGEXPO Budapest Fair Center was chaired by Prof. István Fehér of the Szent István University (SZEI). The Opening and keynote address were delivered by András Pásztohy of MoARD, Prof. József Molnár, Rector of Szent István University, Michal Demes of FAO SEUR, Peter Wellisch, IACS project Manager of the Agricultural and Rural Development Agency (MVH), Attila Tóth, President of the International eFarmer Consortium, Johannes Keizer of FAO GILW at Rome and Tamás Bori of DG Agri of the European Commission. 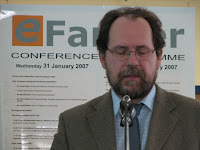 On behalf FAO SEUR Michal Demes made recommendations for strategic partnership including e-Farmer Portal , ESCORENA Network and the FAO related thematic Knowledge Networks. He mentioned implicite the recently started talks with international and Hungarian communities in the field of spatial informatics, spatial data such as digital orthophotos and maps. More geospatial relevant messages of Peter Wellisch, Johannes Keizer, László Gábor Papócsi of SZEI (www.efarmer.net ) and Gábor Csornai, Head of the FÖMI Remote Sensing Center (www.fomi.hu ) will be given asap. It was good to see some HUNAGI members in the audience too. A dedicated two-page leaflet in English has been disseminated on the spot describing HUNAGI, the Hungarian Spatial Data Interest Community in nutshell.